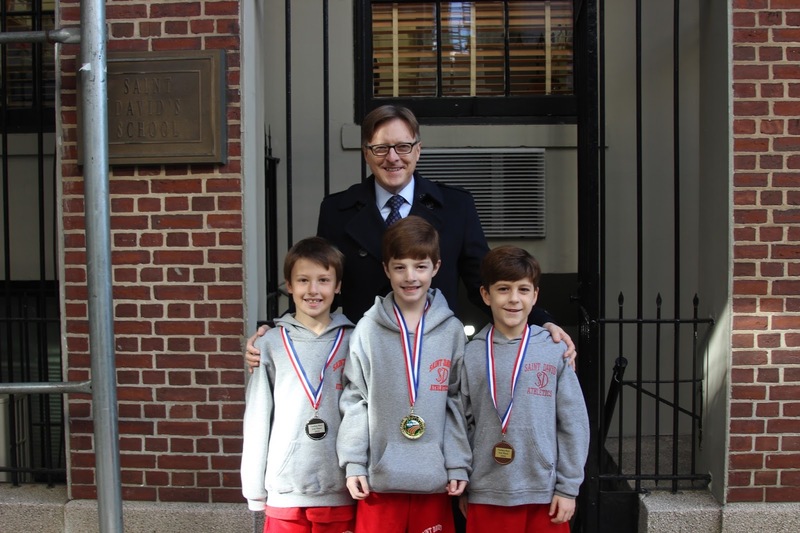 In a new partnership between Saint David's School and Daniel's Music Foundation (www.danielsmusic.org), sixth grade members of Saint David's Headmaster's Community Club now join members of DMF for a series of shared music classes at the DMF facility on Lexington Ave. DMF, founded in 2005 by Daniel Trush (shown in photo above) and his family, runs recreational music programs in a group setting for individuals with different abilities, using the power of music to create community. Yesterday, the boys and I went to DMF after school for our second session. The boys were split into three small groups, each in a different studio engaging in a musical activity with the boys and girls of DMF. Some learned a new song, others played the drums, or participated in a fun dance activity. Smiles were aplenty, and we had a wonderful afternoon. This new partnership between our school and DMF promotes awareness of difference through the common bond of music, an essential facet of Saint David's program. It is an example of the many ways that Saint David's reaches out, beyond the walls of our school to other cultural institutions, exposing our boys to difference and others. Young children come to appreciate that despite the variety of challenges other children may face, inside everyone is very much the same. 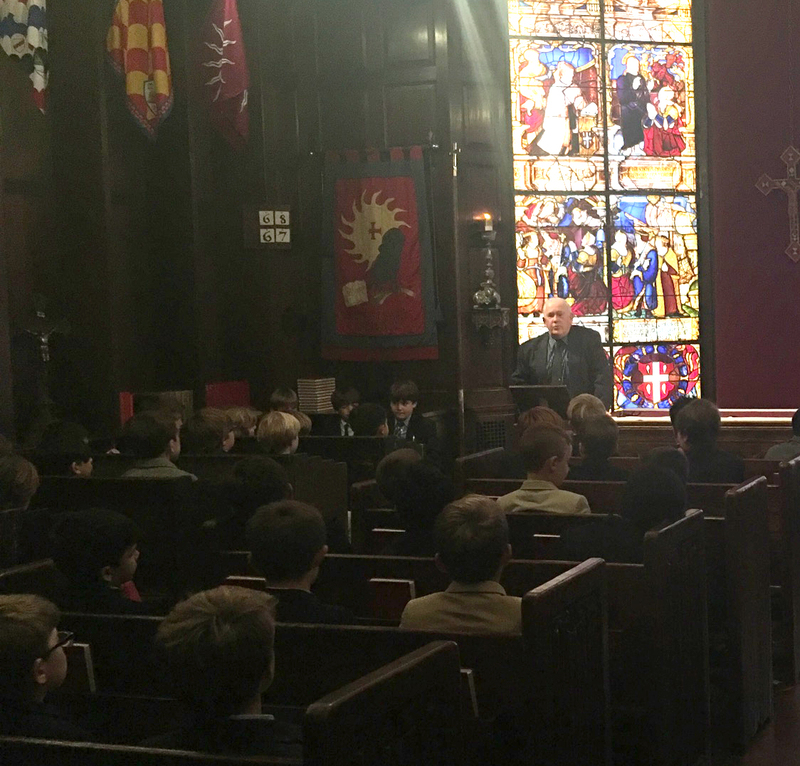 Yesterday evening, William Fitzgerald '08 returned to school to give the Young Alumni Chapel talk, a pre-Thanksgiving tradition, for which we had a record turnout! William focused on the unique values that Saint David's instills in its students, its commitment to balance and producing "men of integrity," and he noted how rare it will be to find a similarly structured environment so supportive going forward. He urged the boys present -- our current eighth graders (younger brother Laird '17 among them) and alumni in high school -- to be ambassadors for Saint David's as they journey through their lives, offering the following five traits as those that will enable them to carry on the tradition of Saint David's: having a strong work ethic, being versatile and open-minded, exhibiting leadership, being humble, and demonstrating kindness. "Remember where you came from, and preserve the legacy of your school." 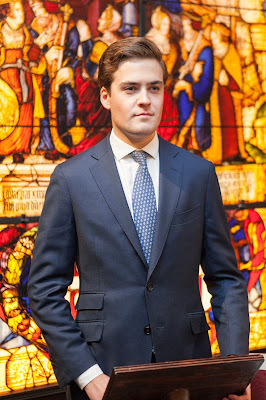 William closed saying that the young alumni present, those soon-to-be, and all of the alumni that preceded them form a "proud family of brothers" that look out for each other. How perfect a sentiment during a time of year that celebrates family! 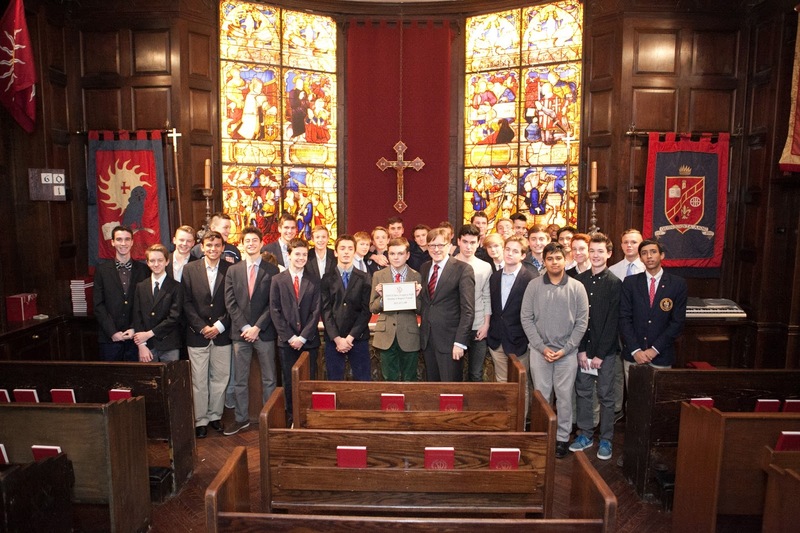 Following the talk, the Class of 2016 posed for a photo with a plaque of their Class Legacy Gift, which supports the Eighth Grade tour of the Sistine Chapel. 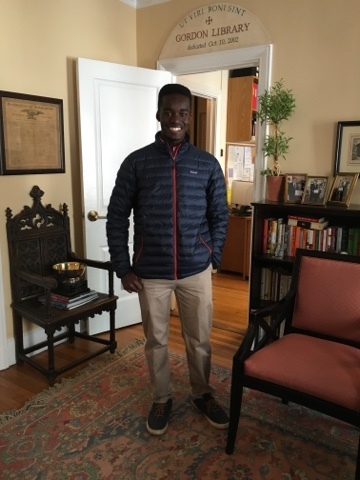 We then all enjoyed a wonderful dinner, during which last year's Student Council President James K '16 presented his class's check for the more than $11,000 raised in support of Saint David's Kalina School in Tigray, Ethiopia. 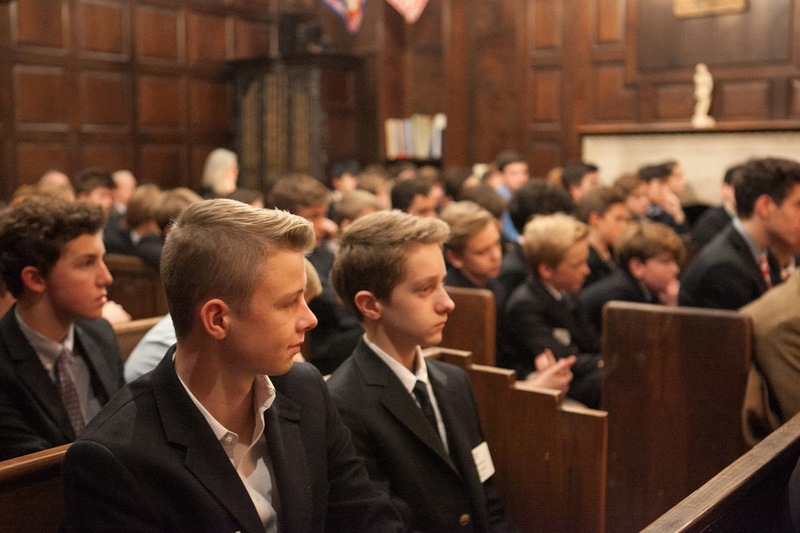 The Young Alumni Chapel and Dinner event is always one of my favorite; it is gratifying to see so many young alumni return to school -- taller, stronger, older, but eminently recognizable as Saint David's boys. 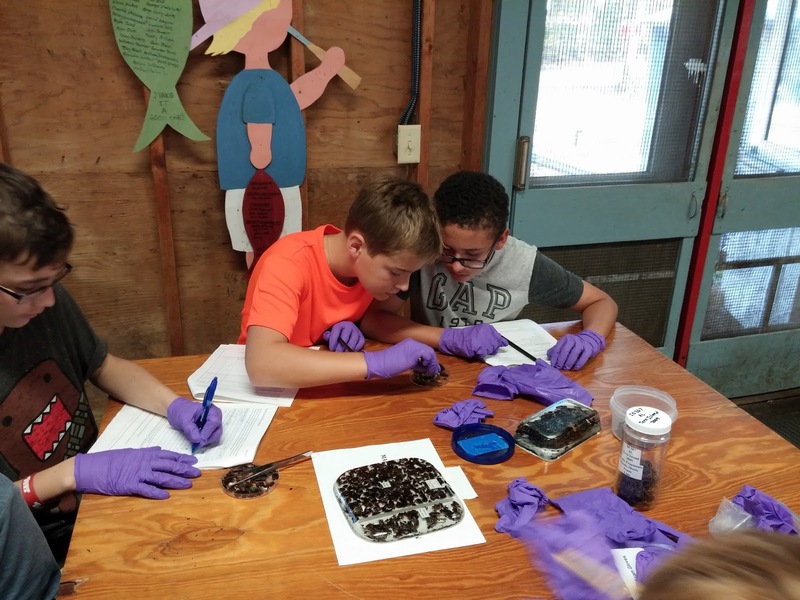 One of our school's longstanding partnerships is with the Woods Hole Oceanographic Institution. 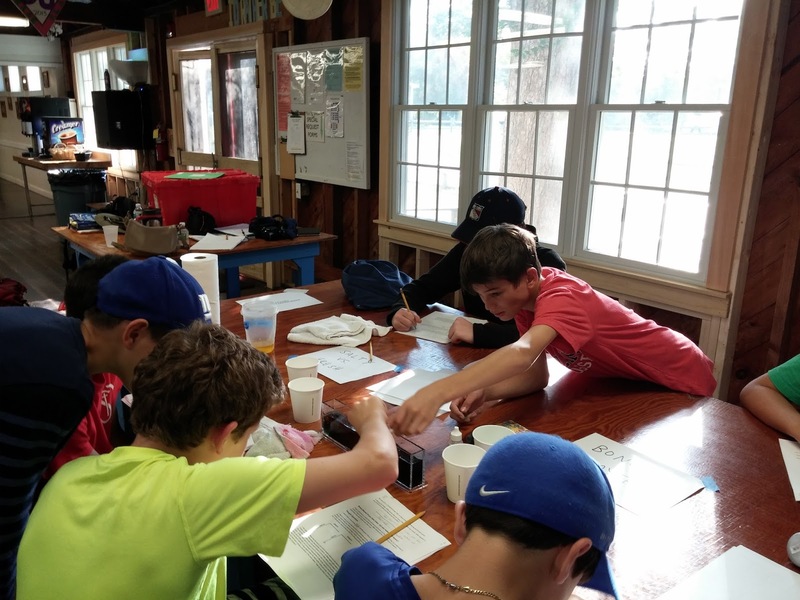 During their week-long interdisciplinary study on Cape Cod last month, our seventh graders investigated marine conservation and sustainability issues through sessions led by WHOI scientists. Dr. Heather Benway, research specialist in marine chemistry and geochemistry, guided the boys in hands-on, site-specific investigations into the physical properties of the ocean. The boys explored the various mechanisms by which water separates into different layered habitats, the impact that ocean acidification has on marine life, and troubles animals face from non-degradable plastics. What a fantastic opportunity for our boys to learn about the ocean by exploring its properties first-hand under the guidance of experts in the field! 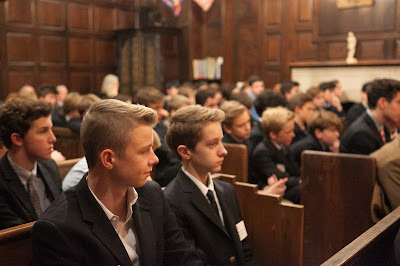 We look to enhance community and fortify the bonds among our boys in many ways at Saint David's. One that stands out is the pairing of seventh graders with a second grader buddy. As both classes prepare to be leaders in their respective schools, they meet several times to participate in a school activity, and exchange thoughts and ideas. At their initial meeting last week, the boys shared snacks and played Thanksgiving-related word games, getting to know one another and establishing rapport. This Wednesday, the second graders will be accompanied by their "big brothers" to Saint Thomas More for our annual Thanksgiving Mass. 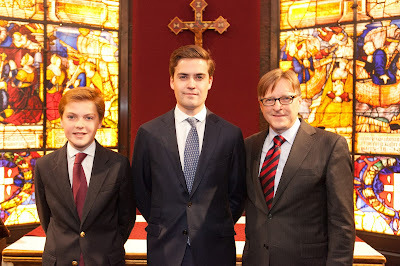 It will be the younger boys' first mass at Saint David's. 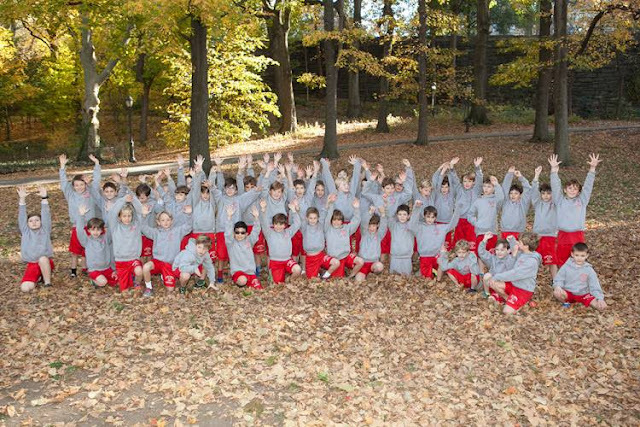 The second graders look up to the older boys, and the older boys relish the opportunity to guide and encourage the younger. Our Third Grade engineers are putting their recent learning about circuits to the test, creating electronic games and devices. Working in small groups, the boys have decided upon the "product" to make, and developed a design. Now, through trial and error, they are testing their creations. The boys are having so much fun getting their race cars, DJ boxes, robots and security systems to work, and are thrilled when parts move and lights flash as intended. This project is a perfect example of the way STEAM projects thoroughly engage our boys in the engineering and design process, as they come to appreciate the iterative nature of the discipline. (Video shows a security alarm that will go off if someone tries to remove a pencil from a desk). 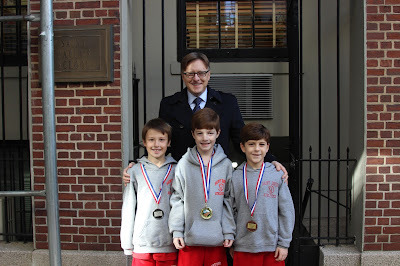 Yesterday saw two great Saint David's "competition" traditions: The Math Bowl and Turkey Run. 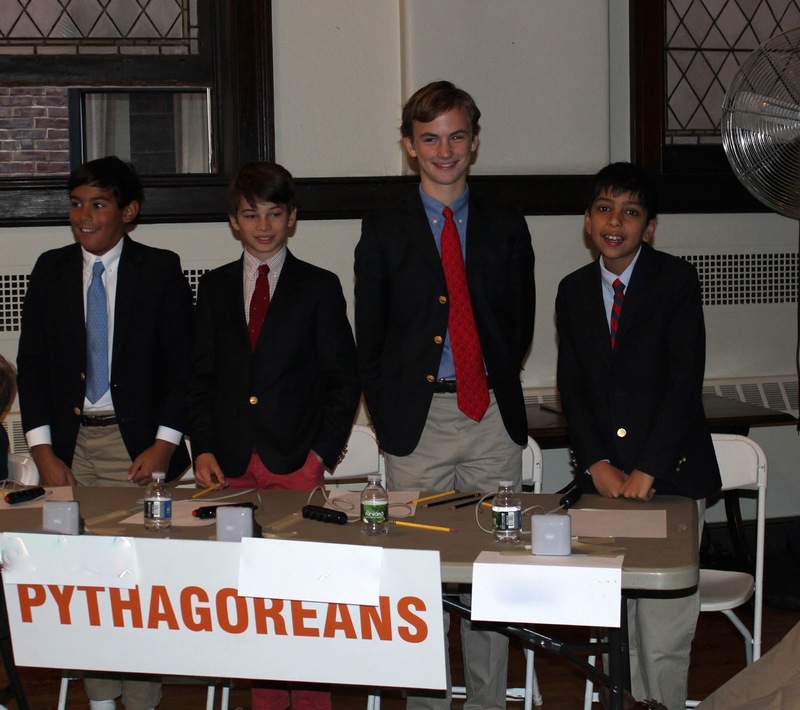 The Math Bowl challenges four teams of our boys in Grades Five through Eight to solve a series of problems with a wide range in difficulty. The Archimedeans, Newtonians, and Euclideans all did well--they know their math! However, the Pythagoreans emerged as the winners. 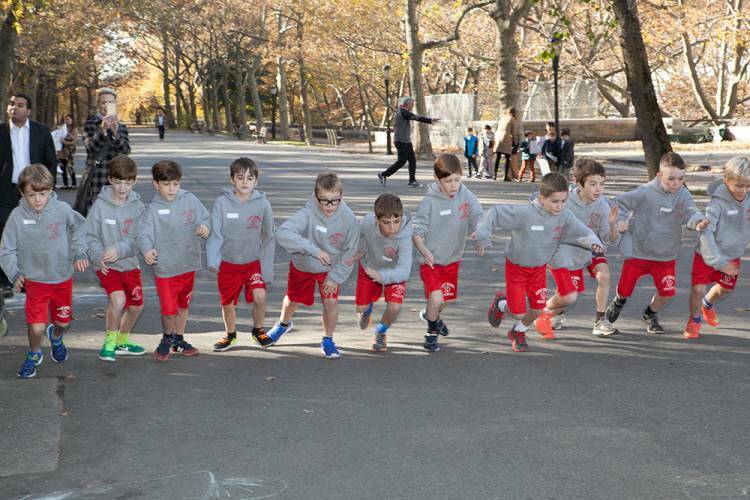 At around the same time, in Riverside Park, our second graders were running in the 450-meter race that marks the arrival of the season at Saint David's, our annual Turkey Run. 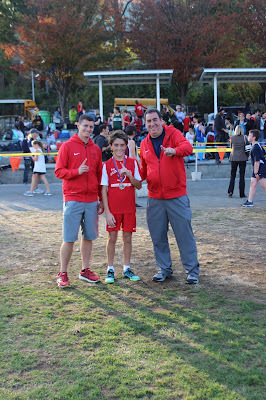 Cheered on by their families, coaches, and teachers, the boys flew through the park, all smiles and speed. They had prepared hard in sports classes for this race and were ready. It was a fun and challenging morning for the boys! Our eighth graders are honing their observational drawing skills in 12 sessions of "Advanced Drawing Bootcamp" through our new partnership with the Guggenheim. 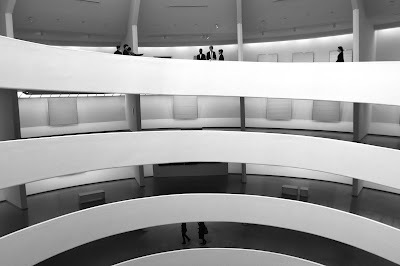 On a recent visit, the boys delved into their preliminary investigations of the Guggenheim's interior, executing a series of pencil drawings on site. The boys learned about the museum's history: how architect Frank Lloyd Wright employed organic architecture (his philosophy that a building should develop out of its natural surroundings) and drew inspiration from the museum's proximity to Central Park. Boys toured the museum rotunda, looking carefully for potential drawing subjects, and then made drawings on the theme of organic architecture in the museum. Throughout this unit, they are being inspired by the architecture of the museum itself, discovering how to create interesting compositions in their own artwork by choosing exciting views of the museum to draw. Our school's proximity to the Guggenheim provides our boys and their teachers with a unique opportunity to extend their art studio learning on-site at this architectural wonder. Our third graders are building circuits that combine input and output pieces. They use littleBits electronics modules and, through trial and error, determine what works (and what doesn't) and the importance of sequencing. These lessons so engage our boys, it is evident they are having a great time while learning. 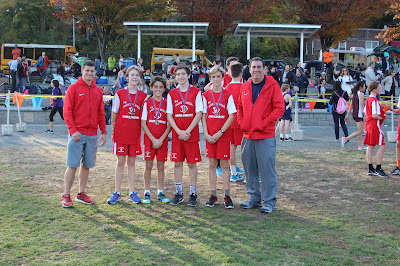 Congratulations to our 7/8 Red Soccer team! Today, our boys won the Manhattan Private Middle School Championship game against Buckley 3-0, giving them an undefeated season. 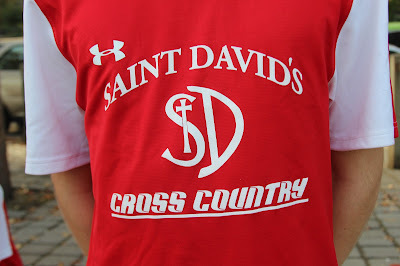 Another great day in sports at Saint David's. 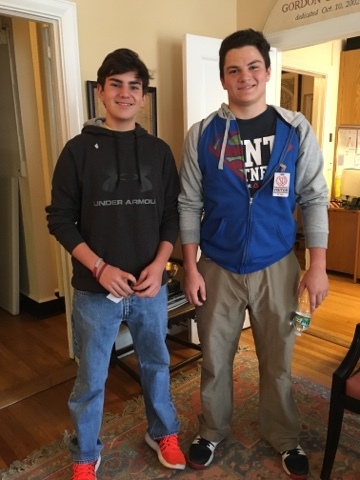 This past week saw several alums come back to Saint David's to visit friends and teachers and regale us with exciting stories of their high school adventures. Above Tyler '14 now at Kent and below Sam and George both '15 now at Fordham Prep. It was really fun to see them--so big! A Coke machine. The Turkey Run. Pioneer Supermarket. What do these have in common? The Thanksgiving Food Drive. Our school's longest running social action project and one that is near and dear to current families and alumni alike, turns 50 this year. Spearheaded by the Eighth Grade, it involves the cooperation and effort of all of our boys and culminates with the delivery of turkeys, holiday meat and groceries to three local churches on the day before Thanksgiving. The Drive kicked off this week: Eighth graders have delivered empty boxes to each classroom. Our Lower School boys will work enthusiastically to fill them with canned goods. 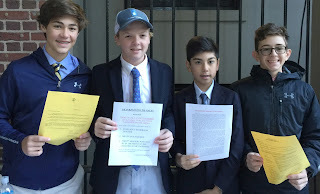 Eighth Grade boys will also make rounds for donations to purchase turkeys, and the pies they sell will supplement the turkey fund. Tom Ryan who, with Gene Romanosky, guides the boys in the social action project gave a Chapel talk to the third and fourth graders yesterday about this great tradition. The Food Drive dates to 1967 when Mal Cleary, Assistant Headmaster at the time, began it with four boxes of groceries donated by our boys and delivered to the nearby Little Sisters of the Poor, nuns who cared for the nearby sick and needy. Bob McLaughlin and Mal Cleary expanded the project to include the collection of turkeys as well as canned goods, delivered to a storefront for the poor on 129th and Madison. Later, Monsignor Tom Leonard's Incarnation Parish became the main recipient of our boys' generosity, and remains so to this day, joined by two staff members' churches: Bethel Community Church, and Lion of Judah Assembly. Last year, our boys collected 7500 cans, which filled a record 252 boxes and sold over 600 holiday pies. As observed by Mr. Ryan: "The eighth graders, in cooperation with the rest of the Saint David’s community... have ventured not so gently into the world of Christian charity and awareness, and have taken some of their first steps toward becoming good men." Regarding that Coke machine, Turkey Run and Pioneer? You'll find the connection in Tom Ryan's history of the Thanksgiving Food Drive. Happy reading. 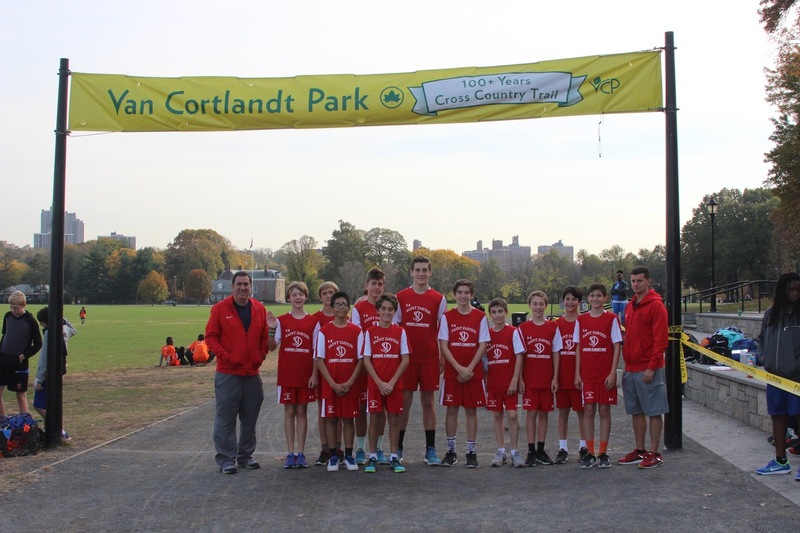 What a day for Saint David's at the Manhattan Private Middle School Championship in Van Cortlandt Park! 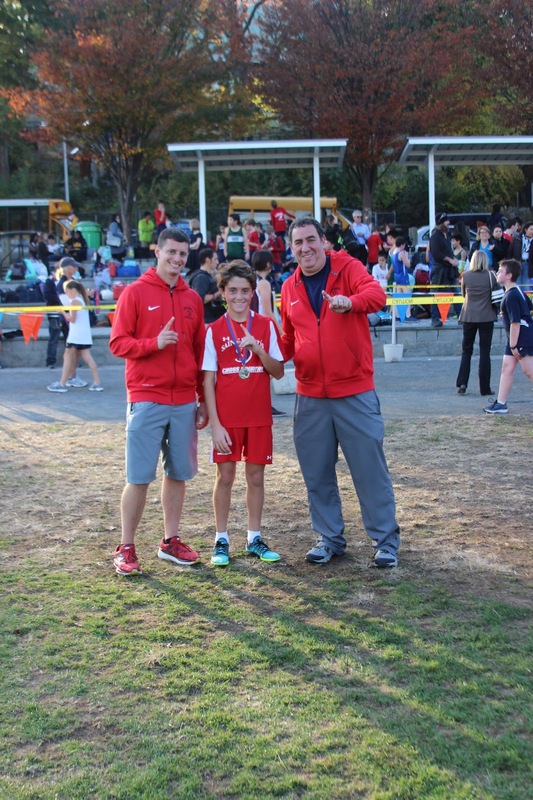 Billy G. '17 won the Championship race, completing his season winning all of the races in which he competed. 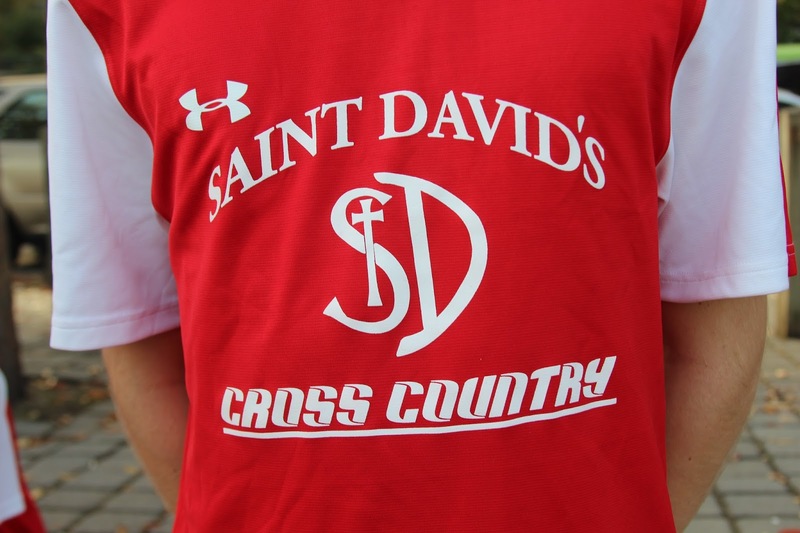 He is the second runner from Saint David's to take home a Cross Country Championship Title, and the first to go undefeated for the season. 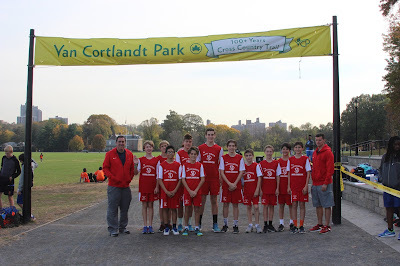 Congratulations also to Conor G. '17, Gavin K '18, and Spencer S. '17 for medaling at the race; each finished in the top 35 out of 200 runners. 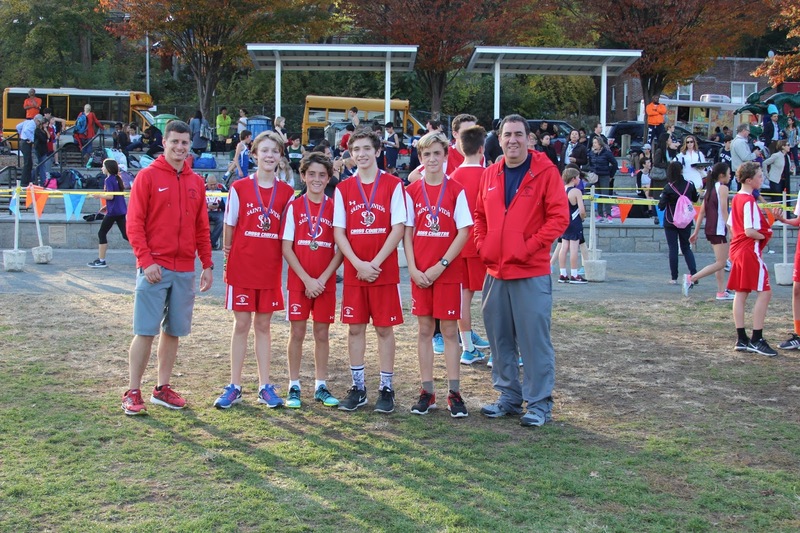 All boys on the team performed exceptionally well this year, clocking their fastest time of the season.